Dalhousie & Khajjiar offer a royal feeling of bygone era of British Raj. The gateway to the Chamba Valley the city of Dalhousie was established by British governor-general Lord Dalhousie in 1854. We arrange Dalhousie Khajjiar Tour for the tourists in the most professional way. The Travel to Dalhousie Khajjiar Tourist Places will provide you with an opportunity to explore alpine vegetation, architectural magnificence. The tourist attraction of Dalhousie & Khajjiar includes Subhash Baoli, Kalatope, Dainkund and so on. 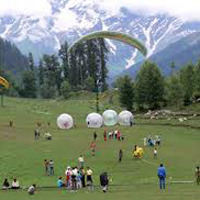 In addition to this, we are counted among the most reputed Travel Agents in Dalhousie Khajjiar. It is springs close to the town, rich in mica and other minerals. It is noted for its medicinal and healing properties. The Bakrota Mall is a popular pathway around hills giving a spectacular view of the mountains all around.